SNAFU! : Arsenal Ship/Missile Barge. Mike at New Wars view. Arsenal Ship/Missile Barge. Mike at New Wars view. Mike at New Wars had this issue pegged a long time ago. I really recommend you go back and read his take on the arsenal ship (heck you should read his blog even though he doesn't update it anymore, it covers issues that we're still banging around). Bear in mind that when he wrote it, the issue was land attack only and the main threat that the arsenal ship represented was to carrier aviation being able to attack targets deep inland with greater precision and less risk than manned aircraft. If we're being honest about it, the UAV is just another take on the arsenal ship, the only difference being that its being deployed from a carrier instead of a 'surface' ship. Very small crew-Only 50 were deemed necessary to operate the 500-800 foot craft. Compare this to 300 on much smaller destroyer, or 6000 needed to crew a Nimitz class aircraft carrier. 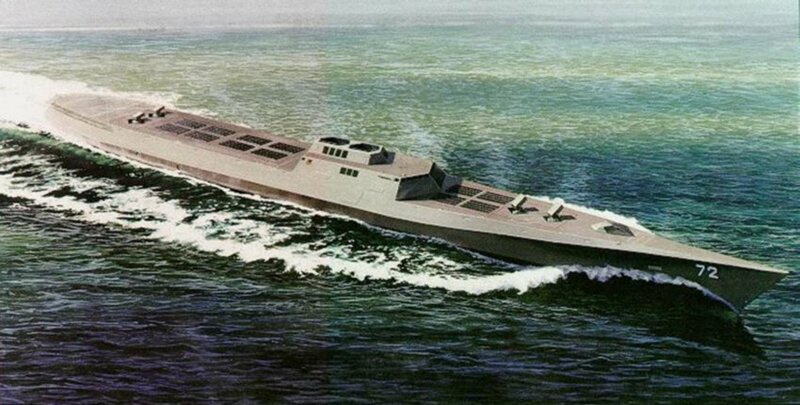 Low cost-The initial version cost about $450 million, or about the price of the tiny new littoral combat ship. The huge weapons payload would have added to the cost, but still come in far less than the $6-$8 billion price tag of a heavy carrier. Water armor-Plans were for the ship to have ballast tanks similar to a submarine, which could be filled to provide a low profile in enemy waters. An added benefit to this, as proved in the Tanker War of the 1980's, is that such a vessel providing its own buoyancy would be extremely difficult to sink. 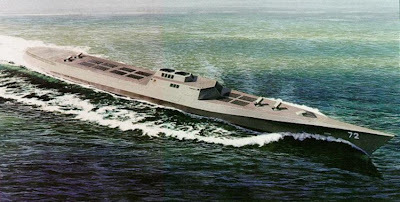 A Digitized Warship-She could have been operated by remote control, with her weapons systems tied into to other Aegis Ships or AWACS aircraft, and aimed accordingly. She would have been an integral part of the US Ballistic Missile Defense program. Guess what boys and girls. That sounds like a mix between an LCS (small crew...but unlike the LCS, the VLS tubes don't need to be maintained so it would have been possible), and a DDG-1000 (digitized and networked...just like the arsenal ship was suppose to be). But even better is what a kid came up with. I don't even know if he realizes how brilliant his idea is. He goes by the name "Infinite Hunter" and he has some 3D models up on Google. What he bashed together was a fictional ship. 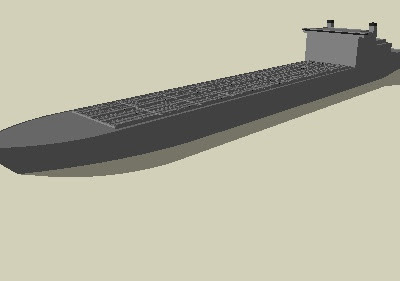 An arsenal ship or missile barge --- he named it a Missile Support Barge (MSB-1) and based it on a container ship! If this idea was followed, you'd have LOW platform cost, a double hull to help protect it against enemy action (and that doesn't include the armor that the launch cells have! ), a small crew and room for any other option you decided to add to the ship! I like it. My buddy Joe likes to point to the Ohio class cruise missile subs as being able to fulfill this role. The problem is that most of the subs missions are classified and have an intel angle to them. Additionally when called upon they might not be in positon to providethe needed support without risking the boat. We need responsive fires. Thats why I like this concept. i understand what you are saying about the ohio class and i think the arsenal ship is great, i preferably like the last one where you have a converted container ship, no need to design anything, its already there, hell you can buy a few from Maresk, i know we only have a few and they are on specialized missions, i guess i should have been more forward that i like the idea of having a sub with alot of VLS cells and we should plan more that can fill that role, if possible have the boomers either have tridents or cruise missiles (since one trident tube can fit many smaller cruises), so you can have more subs in place, we dont have the ability now to do it since we only have four and the missions they do are more intel related like you said but i was thinking in longer naval strategy. Sadly, it is cheaper only if you never use it. Given current weapon system survivability estimates: To make it 'cost effective', we would have to increase the blast (at least by a factor of 2 would be a reasonable guess)and penetration (ditto factor of maybe 10? )of a BGM-109 'like' missile to take care of more than just the limited target set they are now suitable for. That is just the 'effectiveness' side. Costs would have to also come down by about an order of magnitude and that is IF the system reliability can be improved. I could crunch the numbers again to update them from a study I did eons ago to firm up the numbers, but I don't think it would make them look any better. There's also an 'eggs in one basket' aspect that would make a targeteer drool. I AM enjoying your thought experiments concerning force structure though. Very interesting. As SMSgt Mac said, it would be a targeeter dream ship. So, take the eggs out of the basket and start putting them in smaller baskets in the form of containers spread throughout all sorts of surface vessels? The enemy wouldn't know from where the threats would come. just like an aircraft carrier is now? just like a large amphib is now? just like an MPS ship is now? or hey, lets talk about ballistic subs! we have nothing but high value target ships! the only difference is that this ship will help stop saturation attacks by aircraft, help against ballistic missile antiship missiles and provide hellp against ships (with antiship tomahawks) too. 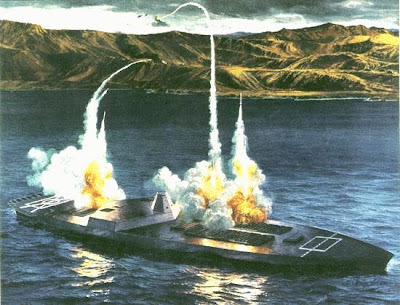 I'm not talking about Sea Sparrow or Rolling Air-frame Missiles, I'm talking about Standard, Harpoons, Tomahawks. The Armored Box Launchers and the ground-launched Gryphon trailers were about the size of a shipping container. I think the Missile Support Barge is pretty doable, I'm just saying, why stop there? Install containers on the entire fleet. Does the USN really need more VLS for Tomahawk? Given the USN maintains about 3,500 I'd suggest we need more missiles and that perhaps if the inventory were increased significantly then we can talk about more ships of what type to carry them. If anything I'd suggest the need is for more SM-2/3/6's supporting our battle groups. The only requirement here a 30 knot ship able to keep up with the battle group. The next question is how many VLS and I'd suggest about 160. Whatever the ship costs with 160 missiles you're talking ballpark $3 billion worth of missiles which is about as much as maybe we should risk on one hull. With much of an investment in missiles the ship needs to be reasonably protected. In terms of Tomahawk consider all our SSN's carry 12+ (636), the SSGN's carry 616, and if one assumes 12 per CG-47 and DDG-51 that's about 1,000 with another 180 or so on the 3 new DDG-1000 or about 2,400+ with little fuss and some ships and subs carry more than 12. All 3,500 can't be at sea as some are always being rebuilt or upgraded. I'd also suggest that if it's too dangerous for an SSGN to launch it's certainly not safe for surface ships. A new SSGN based on the Virginia's should be a priority but in the current budget climate it's never going to happen when we can't even build enough SSN's. Even here though it's worth pointing out the Virginia's have 12 VLS plus 38 more torpedoes and missiles. It's not unreasonable for all of them to carry 24+ Tomahawk's which adds another 600. The USN needs a larger Tomahawk inventory. What I would wonder about, particularly with regard to land attack cruise missiles, is how much cost could go down if size were allowed to go up. If you have one cruise missile for all your needs, you wind up with an extremely capable missile where sizing is determined by the smallest envelope (a torpedo tube or VLS cell) and 'toughness' is determined by the harshest submarine launch or air launch scenario. Making things smaller and adding toughness costs: look at the costs of a PC vs. a laptop vs. a hardened laptop. On conventional ships and especially on aircraft and submarines, space is expensive so it makes a lot of sense to spend to use it effectively, but on a container ship based arsenal ship space is comparatively cheap. Actually I have severe doubts about whether relaxing size constraints could result in a missile so much cheaper that it was worth another development program but it would be interesting to see some numbers on an 'arsenal ship only' low cost cruise missile.